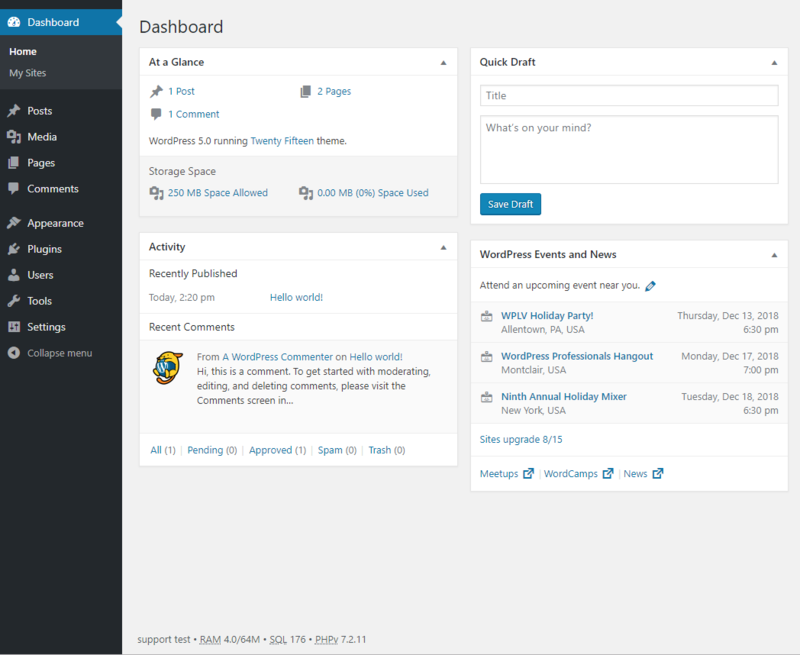 The Dashboard is the first screen you see after you log into the administration area of your WordPress site. It is a place where you can get a convenient at-a-glance overview of what’s happening on your site and in the world of WordPress. 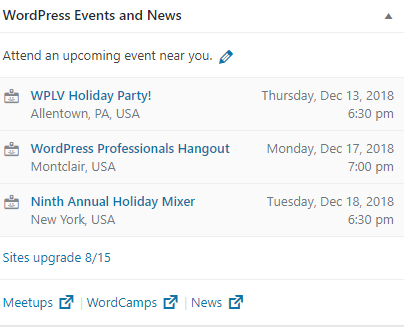 You can catch up on WordPress news, view your draft posts, see who’s linking to you, quickly create a blog post, or check out and moderate your latest comments. It’s like a bird’s-eye view of operations, from which you can swoop down into the particular details. The At a Glance module offers an “at-a-glance” look at what is on your site. 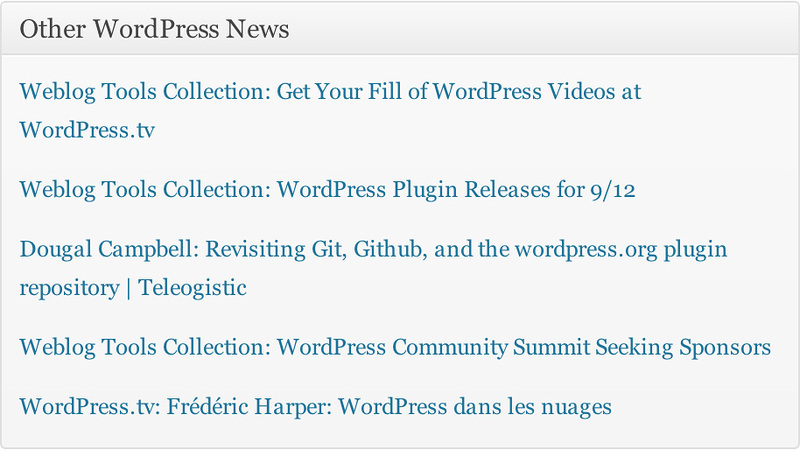 The Content column displays a total count of the blog posts, pages, categories, and tags of your site. Below this, important info about the name of the theme you are using, as well as the version of WordPress your site is running. 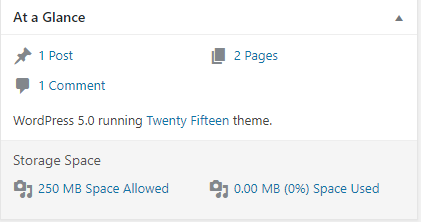 Clicking on the theme name will take you directly to the administration screen for that section. under ‘Storage Space’ you will see how much space you have left for your site, as well as how many MB of Media you have uploaded onto your site. By default each site created starts with 250 MB of space. If more storage space is needed please submit a TUHelp ticket requesting more storage space for your site. 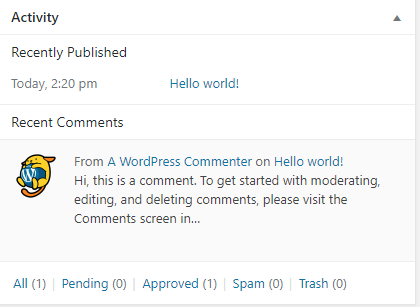 The Activity module displays a count of the total, approved, pending, and spam comments on your site. Clicking on either the name of the section or the number of items will take you directly to the administration screen for that section. This section also displays a list of the most Recent Comments and published pages on your blog. Comments that are held in moderation (pending your approval) are highlighted in yellow, as well as marked[pending], to distinguish them from ones you have already approved for publication. The Quick Draft module is a miniature “post editor” that allows you to quickly create a blog post from directly within the Dashboard. You can include a title and body text in the post. 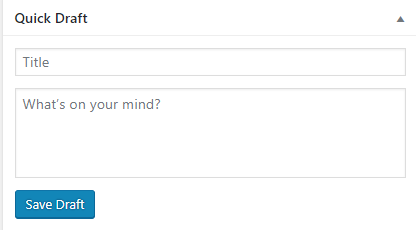 You will have to save your QuickPress post as a draft, which you could publish at a later time. 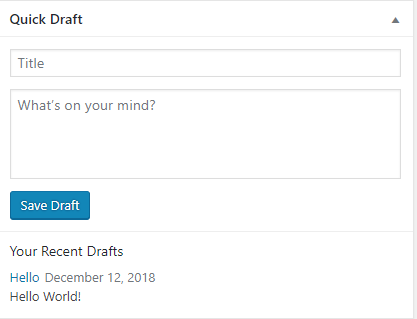 If you already have a draft on your site, you will see your drafts populated below. You will also see announcements for any work that may be happening on the server, like upgrade announcements. Note: You can change the settings on this module to customize it’s display.